Looking for a POS Mount or Touch Screen Mount for your Touch Screen Monitor or Tablet? Choose from a wide selection (many makes and models) of POS Mounts (point of sale mounts) and touch screen mounts for your monitor or tablet. Perfect for any point of sale system. If your looking for a POS mount or tablet POS mount, your looking for height adjustability, a low profile footprint for maximum counter space, and finally a wide range of flexibility including the compatibility with heavier monitors and TV's. We also offer POS wall mounts, back to back POS mounts and POS accessories like CPU mounts, keyboard trays, POS printer trays and terminal stands. 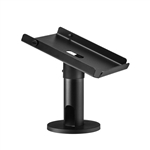 You will also find specialty POS mounts like kiosk mounts for tablets and monitors. Bolt Down Swivel Table Stand and POS Stand for monitors up to 30 lbs.